Timmy Hogan You are my go-to music on my radio show on manaoradio.com ! Daniel McAdams Amazing band + amazing music + amazing show = a trifecta of perfection. MUST SEE show. MUST LISTEN to music. Celicia Soria Beats Antique never disappoints. A Thousand Acts II is a great follow up to Act I. Favorite track: Dragon's Eye. Kelley Combs My sister got me hooked on Beats Antique. I love the music. I play it while cooking, cleaning and meditating. I also play it for my plants outside while gardening, they like it too! "a song you can shimmy to. Not just parts of it, but the entire thing and that is a rare thing." Favorite track: Puzzle. David Satori - Electric Guitar, Banjo, Lap Steel guitar, Viola, Composition. Sidecar Tommy - Drums, Piano, Organ, Bass, Composition. 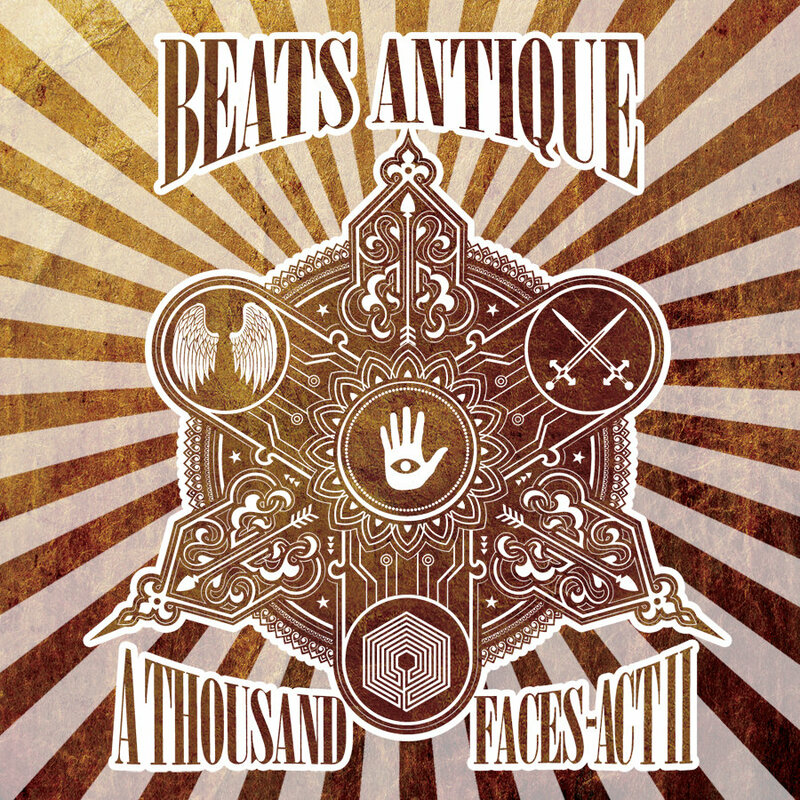 Produced, Engineered and Mixed by Beats Antique. Additional Production and Mixing by Eric Oberthaler and R.D. White. Except Track 9 Is Co-Written by Sylvain Carton. Lyrics on Track 3 is by Morgan Sorne. Additional Orchestration - Brian Adam McCune (1,5,8). Awesome Orchestra Recorded at Fantasy Studios. Engineered and Mixed by Beats Antique and Jesse Nichols. Graphic Design by Sarit Melmed. Guest Musicians: Antibalas Horns (6), Alam Khan (4), Sorne (3), Sylvain Carton (9), Lila Sklar (1,5,8), Jess Ivry - Cello (1,5,8), Eric Perney - Upright Bass (1,8), Awesöme Orchestra (1,5,8) Conducted by David Möschler.